Multidisciplinary chef who reaches pastry through savory cuisine. Spain’s champion in 2001. Inexhaustible source of creativity. As he likes to explain, he reached pastry through savory cuisine. His enthusiasm for learning pastry from scratch led Miguel Sierra, MMAPE 01, to Torreblanca’s workshop, which would mean a dramatic change in his professional career. Behind his works, there is always a meaning, a ‘reason why’, but he also intends to make us enjoy with his creations. Content, form and flavor are all at the same level. Like few others, he knows how to link his work with his hometown, Avilés (Spain), finding inspiration in both its natural and industrial scenery. 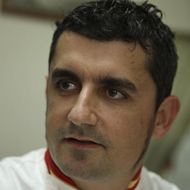 He is co-author of the book ‘Seven Masters of Modern Spanish Pâtisserie’, by grupoVilbo. 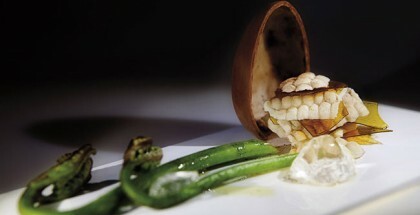 2000 – Europe’s Best Creative Fish Dish Award (Regional Flavours of Europe Cup), Maastricht. 2001 – Spain’s Best Dish Award, at the National Contest of Mediterranean Diet, Interalimed, Valencia.